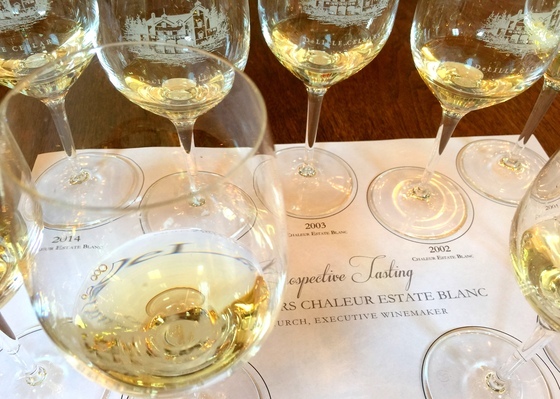 20 Vintages of Washington's "White Bordeaux"
Chaleur Estate Blanc, one of DeLille Cellars labels, is probably the most serious white wine produced in Washington State. 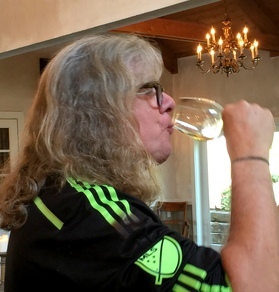 It's a Bordeaux-style blend of sémillon and sauvignon blanc that stands out from the field of perfectly drinkable Washington whites by its ability to age like a great work of art: with grace and dignity. This became evident at a recent retrospective tasting of Chaleur Estate whites dating back to 1996. Grapes come from Red Mountain's award-winning vineyards: Ciel du Cheval, Boushey, Klipsun and Sagemoor vineyards. DeLille's wine maker, Chris Upchurch (left), treats the grapes as if they were ingredients in a premium red wine: low crop levels (three tons to the acre), whole berry fermentation with native yeasts, moderate use of French oak. Most white wines get little respect (think chardonnay, think sauv blanc) because they're based on high yields and quick-and-dirty winemaking. They sell at low prices because the wine makers don't make much of an effort at quality. It's a self-fulfilling prophecy. The proof of Chaleur Estate Blanc's quality is in the glass, and here the wine writers are having a field day. Dried apricots, figs, grapefruit, gooseberies, lemon, lime, hazelnuts, grilled bread, toasted straw, flint. No question that it has a rich and silky mouthfeel, and a lingering, nutty finish. It's as good as the white Bordeaux blends it emulates (names like Haut Brion Blanc, Domaine du Chevalier, Château Smith Haut Lafitte, or Château Carbonnieux), yet it's only half their price. This page contains a single entry by Cornichon published on August 19, 2015 10:00 AM. Second Avenue's "Rite of Passage" was the previous entry in this blog. Madrona Arms to open in September is the next entry in this blog. Second Avenue's "Rite of Passage"